So far, I’ve done fairly well in keeping up with my monthly goals for A Lovely Year of Finishes. I’m pleased that I’ve managed to keep myself to the goals I’ve assigned myself – that’s not typical for me, when it comes to quilting. I usually let myself work on projects as the mood strikes. Maybe I’m just in the mood to actually have some new quilts in the house! This is From an Unquiet Mind I: Semi-Phores. I began piecing this from scraps when my father was in the hospital over this past summer. I couldn’t be with him daily, but I could find some solace in making something. I couldn’t fix everything that was wrong, but I could make something whole out of things that might otherwise be discarded. It quickly reached a point in which I felt it was complete, so I thought I’d make a small wall hanging from it, and turned to quilting it. I decided to attempt using my Janome with a walking foot for quilting, because my Brother PC210 doesn’t like quilting anything. Despite alternating the directions in which I quilted, I ended up with an undeniable wave to the quilt sandwich. Initially, I thought I’d throw it away, but by this time, Dad was temporarily living with us, and he convinced me to set it aside. Now, I think I’m ready to return to this project, and try to salvage it. We’ll see how this goes. It’s such a beautiful quilt and the quilting pattern is amazing. I hope you can salvage it. Is that wave so bad? I think it still looks awesome. It’s a really striking design! I hope you can finish it to satisfaction. I love the quilt and the quilting fits the design beautifully. It’s really frustrating when you end up with a wave or a pleat in an otherwise beautiful quilt. But I assume it is intended as a lap quilt, and if so, no one will ever even notice while they are snuggling up in it. I see the wave, but here’s how I look at it. The wind is blowing those semaphore flags! I would just persevere to the end and square it up. 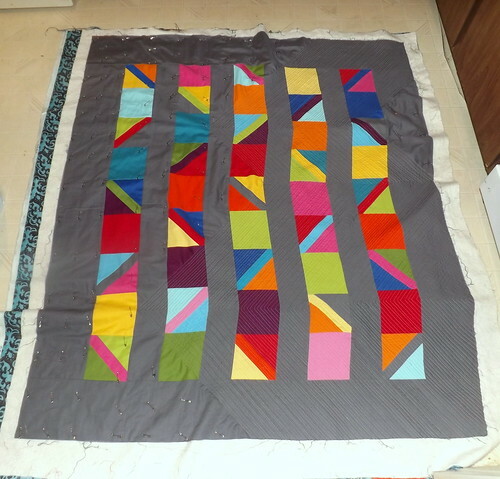 Those quilting lines are quite nice actually. I hope you can find a way to make it work. Maybe just cut the quilt up in a zig zag?